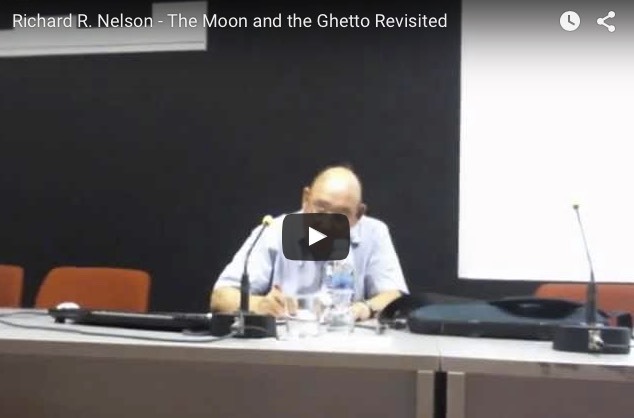 Over thirty years ago I wrote an extended essay, The Moon and the Ghetto, concerned with the troubling question of why societies so rich and capable technologically and organizationally as to be able to land a man on the moon seemed unable to deal effectively with e.g. poverty, illiteracy, slums. I argued that, while politics was part of the reason, in many cases the problem was that our scientific knowledge and technological know-how was not sufficient to point the way to a solution. The general problem of the great unevenness of human progress has not gone away. The questions explored in this seminar are, first, what lies behind the great unevenness of scientific and technological progress. And second, under what conditions does it make sense to seek a solution to a problem by trying to develop stronger know-how. Can progress be made by reorienting our innovation systems? You can watch his lecture given at INGENIO in Spain on Youtube.